Elevate your everyday dining experience and eat in style with this exquisite metallic Cutlery Set from Dokaworld. Made from the highest quality 18/10 stainless steel, this flatware features a beautiful mirrored surface and a good combination of traditional design and balance to add elegance to any decor. This eating utensil set has a nice feel when held individually or together. Every piece blends in well with a casual setup and also feels extremely comfortable in the mouth. Hand-polished for a contemporary shine and gracefully lined to add more charm to your delicate d?cor, this flatware comes with a universal appeal and an ability to fit in with just about every type of dinnerware in your dining room. It is designed with an ergonomic handle that is comfortable to hold and ideal for everyday dining or special occasions. Great for global and continental-inspired tables, it is the perfect tableware for luxury restaurant and hotel settings. A durable investment that could be passed down generations! Featuring an aesthetic design, not only does this metallic kitchen tool look stunning, if feels properly weighted and balanced in your hand and never needs polishing. These simple serving silverwares will also retain heat and cold making them perfect to be used in a variety of basic kitchen tools including oven, refrigerator, freezer and more. It is dishwasher safe and will withstand the rigors of everyday use to last for years. 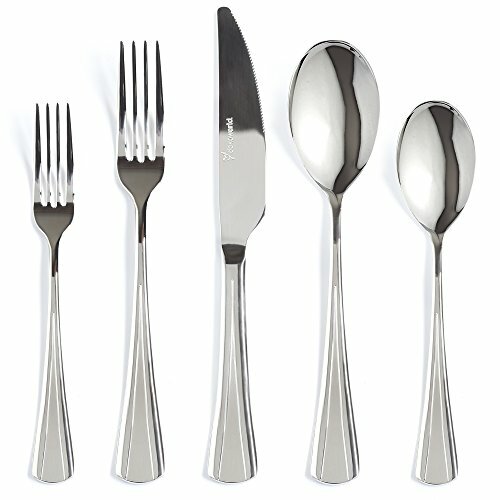 This full 20-Piece flatware set comes with all the pieces you need for a great family super and a wonderful dinner of four adult persons including dinner spoon, dinner fork, dinner knife, dessert fork and dessert spoon in mirror polish. If you have any questions about this product by DOKAWORLD, contact us by completing and submitting the form below. If you are looking for a specif part number, please include it with your message.